Stanley Leonard Roy Harvey enlisted in Brisbane on 21 August 1916. In the preceding month there had been 23,000 Australian casualties at Fromelles and Pozières, and that news seems to have dampened enlistment numbers substantially in August. Those like Roy who did still enlist, must have had courage and/or a powerful sense of duty. Roy was also leaving his wife and daughter, born the previous month, as well as his career as an accountant. These weren't the usual characteristics of recruits - the large majority (about 80% were single men and professionals made up less than 5% of recruits. His eldest brother, Percival Thomas Hynson Harvey, had enlisted in Adelaide in the reinforcements for the 50th Infantry Battalion in December 1915. He was invalided back to Australia in the middle of 1917. Roy was born in Adelaide on 24 December 1889, the youngest son of Thomas Harvey and Catherine Frances nee Hinton. The family lived in Westbourne Park, Adelaide. Educated at the School of Mines and Industries in Adelaide, Roy later worked as accountant for George Wills and Co. Ltd and was an Associate of the Federal Institute of Accountants and of the South Australian Institute of Accountants. George Wills was a major importer in South Australia and the subsidiary company in which Roy was employed was a shipping agency based in Adelaide. Roy was also known in Adelaide as ‘a splendid athlete, a champion amateur boxer and wrestler, and a lacrosseur with the Goodwood team’. In addition, he took a prominent part in Young Men’s Christian Association (YMCA) work. George Wills extended his business interests by going into a partnership to create the Brisbane-based shipping agency Wills, Gilchrist and Sanderson Ltd. Wool was booming and George Wills no doubt saw an excellent opportunity. The firm was given a designated siding on the rail branch that ran to the wharf complex at Teneriffe – as was the case with a number of other businesses such as Goldsborough Mort and Dalgety and Co. In 1913 Roy moved to Wills, Gilchrist and Sanderson in Brisbane. It seems a reasonable assumption that the shrewd businessman George Wills must have had confidence in young Roy Harvey, and perhaps even that he wanted one of his people on the ground in Brisbane to keep an eye on things. 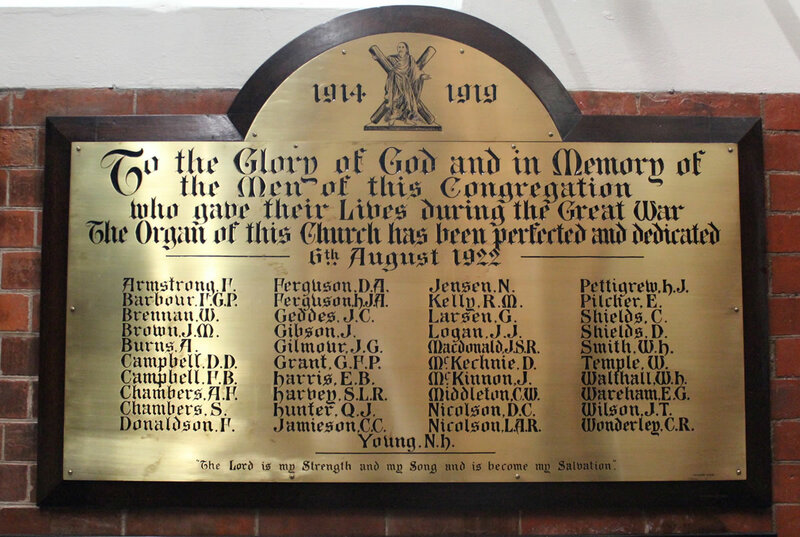 In Brisbane Roy met Charlotte Dorothy Gordon, a 21 years old typist, and they became engaged in January 1915 - marrying on 9 October 1915 at Saint Andrew’s Presbyterian Church (on the corner of Ann and Creek Streets). At that time, Roy’s address was the Brisbane YMCA and Dorothy was residing at Divinity Hall (a theological college) in Ann Street. Dorothy’s interesting address was presumably because her father – Alexander Gordon - was the caretaker of Saint Andrew’s Church and Divinity Hall. Dorothy’s mother was Jane Charlotte nee James. A daughter - Vera Dorothy - was born to Roy and Dorothy in July 1916. On enlistment Roy was aged 24, 164 cms tall, weighed 61.2 kg, had blue eyes, brown hair and a medium complexion, and gave his religion as Church of England. He was initially placed with the Infantry, but in January 1917 was selected for the artillery and underwent training in Sydney. He embarked in Melbourne on the HMAT Suevic A29 on 21 June 1917. During the voyage he was hospitalised with mumps for 10 days, and he disembarked at Liverpool in England on 26 August 1917. In France Roy was taken on strength on 23 October 1917 with the 3rd battery, 1st Field Artillery Brigade, part of the 1st Division Artillery. At this point the 1st Division was moving forward to the front line. On the night of October 28th the 5th and 6th Batteries on Anzac Ridge, including their commanders, were put out of action by gas. On November 2nd two more battery commanders were gassed, and died within forty-eight hours. Roy became one of the mustard gas casualties and was taken to the 2nd Canadian Casualty Clearing Station at Poperinghe, Belgium. He was so badly affected that he died there the same day - 3 November 1917. He was buried in Lijssenthoek Military Cemetery (grave XXI.HH.8A). Roy had made a will in October 1916 leaving the whole of his estate to Dorothy. As a war widow she was granted a war pension of two pounds per fortnight ($169 in today’s currency) with effect from 14 January 1918. 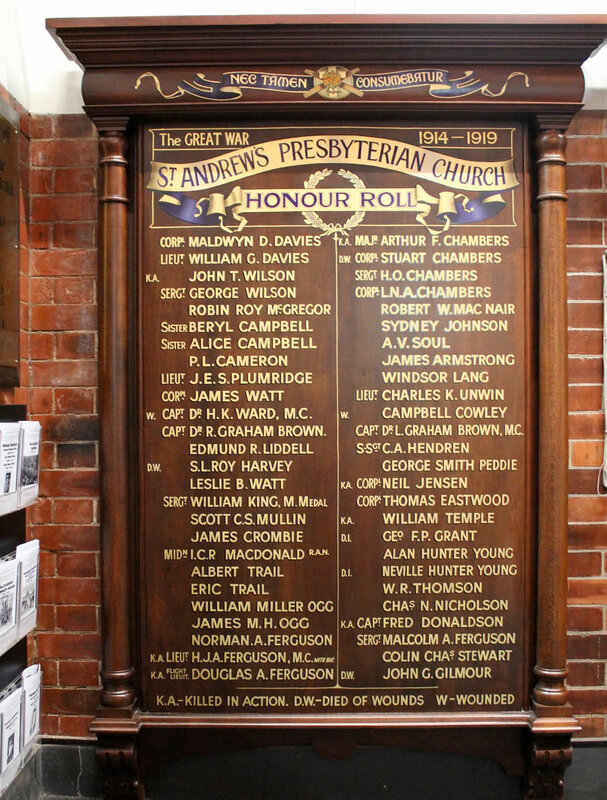 Dorothy was a member of the Saint Andrew’s congregation and, in the Church, Roy is commemorated on one of the Honour Boards and on a brass plaque listing those who made the ultimate sacrifice. Dorothy later worked as an occupational therapist and died at the age of 72 in 1966, while Vera became a school teacher and married in 1941. • Australian War Memorial – Roll of honour, embarkation roll. • National Archives of Australia – service records. • Queensland birth, marriage and death registers. • State Records of South Australia – photograph. • Bean C.E.W., ‘The Australian Imperial Force in France, 1917’ Vol IV Official History of Australia in the War of 1914-1918 Sydney 1921-1942. • Bridgstock V., Tides of Teneriffe: ebb and flow in a riverside suburb New Farm 2009. • Horner D.M., The gunners: a history of Australian artillery Sydney 1995. • Dean E.T., The War Service Record of the first Australian field artillery brigade, 1914-1919 Adelaide 1919. • Observer (Adelaide) 8 Dec 1917 p27. • The Advertiser (Adelaide) 1 Dec 1917 p8. • The Queenslander (Brisbane) 8 December 1917 p9. • The Register (Adelaide) 15 December 1917 p10. • The Week (Brisbane) 23 Nov 1917 p15.